Last week while running around preparing to travel to Los Angeles for a Hollywood Premiere of All You Need is Love, I stumble my tired soul into Dubai mall to meet with Eberhard & Co., renowned Swiss master creators of technically complex timepieces where they were unveiling a stunning collection of novelty pieces for fine watch lovers in the region. Presenting this exquisite collection of highly exclusive master creations at the Manufacture’s exclusive point of sale at the Damas Les Exclusives boutique in Dubai Mall was Eberhard & Co. CEO, Mario Peserico. A delightful soul himself who was most gracious about me being late, he explained how each one of the unveiled timepieces represented different facets of the skills and innovativeness of their master craftsmen. They certainly are outstanding examples of high-end mechanical watchmaking. The Novelties Collection includes creative reworking of some of the Manufacture’s renowned classics including the new Contograf, a re‐edition of the 1960’s classic creation of the same name, which was an emblem of its era thanks to its innovative features. Most of these original features have been maintained in the new 2014 edition, but there is no shortage of innovative details: the new ceramic bezel with unidirectional rotation serves as a frame for the tachymeter scale inspired by automotive design. The case back is screwed‐in like in the original version and contains the inscription “Tribute to Contograf ‐ 1960s”. The date window at 6 o’clock has kept its particular trapezoidal shape. The innovations include the new metallic bracelet Chassis and an original black leather strap with a “red arrow” embroidered detail. The deployment buckle Déclic (Patented) is available as an accessory. The 8147 calibre (base ETA 7750 13¼) guarantees the reliability and precision that have made Eberhard & Co. one of the points of reference for mechanical chronographs. Eberhard & Co. is offering the svelte Traversetolo watch in two new versions: – a version with a white dial and a white second’s counter highlighted by “azurée” finish and a black profile. The profile of the minutes hand is also black and has an “azurée” finish. The hour markers stand out as they are rhodium plated, rounded and inlaid with black superluminova, while the upper part has a diamond-shaped radius. A second version is black, with a black seconds counter highlighted by “azurée” finish and a white profile. The profile of the minutes counter is also white. 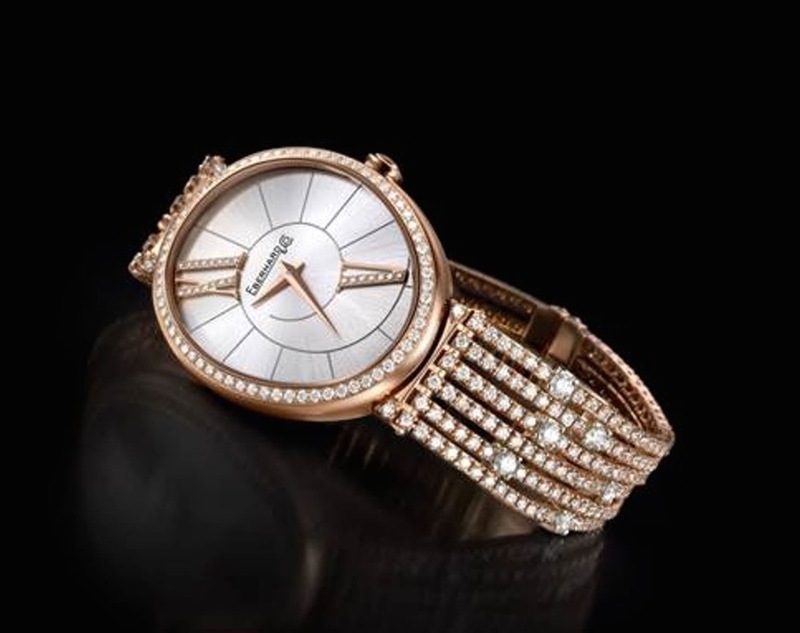 Gilda, the timepiece that exudes feminine charm and provides the complete expression of the watchmaker’s refined and elegant world is presented in a new floral version. Gilda Floral has soft, harmonious lines enveloping a white mother of pearl dial with a delicate floral motif, finished with beautiful sapphires. In this new version the bezel, covered with 66 enchanting blue sapphires, frames the dial with a total of 112 precious stones and an elliptical case in white gold. The result is a masterpiece of craftsmanship and style. Eberhard & Co.’s brand new interpretation of the Extra-fort model produced in an edition that is limited to just 150 pieces, to celebrate the 150th anniversary of noted Italian author Gabriele D’Annunzio’s birth. An automatic chronograph with elegant and harmonious lines, a 41 mm steel case and a face that reflects the great personality of the man to whom it is dedicated: black with white contrasts, personalised with the author’s signature, the 150th anniversary date and the famous motto “Ardisco non ordisco” – in a Liberty style font – adorning the profile of the 30 minute chronograph counter at 3 o’clock. D’Annunzio’s signature is also etched on the case back, which is closed with 6 screws. 50 m waterproof, this special Extra-fort is available with a crocodile strap or “Chalin” steel bracelet. Chrono 4 is the first and only chronograph in the history of watchmaking with four aligned counters. This Registered Design is an aesthetic and functional innovation and represents a technical revolution thanks to the device developed and patented by Eberhard & Co. with sophisticated complexity. Indeed the entire mechanism operates using no fewer than 53 rubies. Never before had minutes, hours, 24 hours and seconds been arranged horizontally in a linear progression. Never before had reading the time felt so extraordinarily natural. 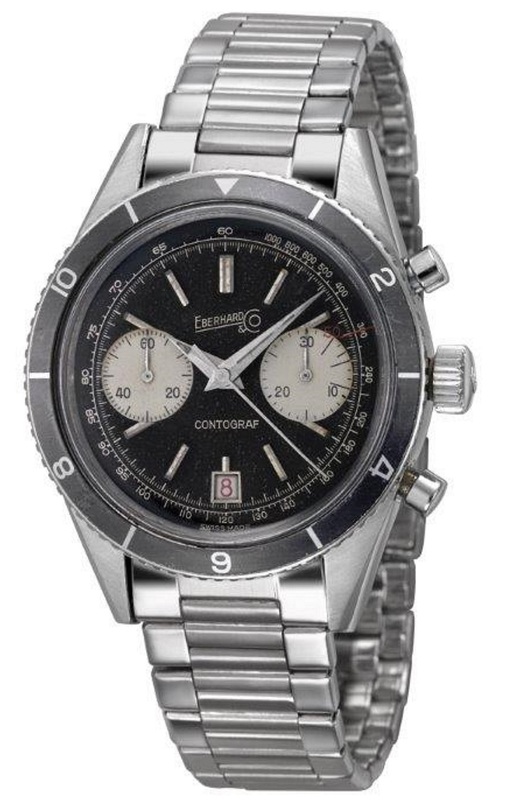 Eberhard & Co. now presents this all-time classic in three new versions. The first version has a white face, 4 white counters with a contrasting black outline and azuré finishing; the second version has a black face, 4 black counters with a contrasting white outline and azuré finishing; the third is a rugged all-black version with a black face, 4 black counters with a contrasting silvery outline and azuré finishing, as well as a red hand for 24- hour counter.